A corpse flower, which is opening early in Adelaide, in time for Halloween. 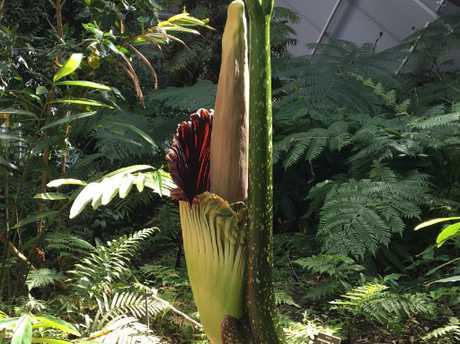 A GIANT and rare tropical flower has bloomed in the Adelaide Botanical Gardens. 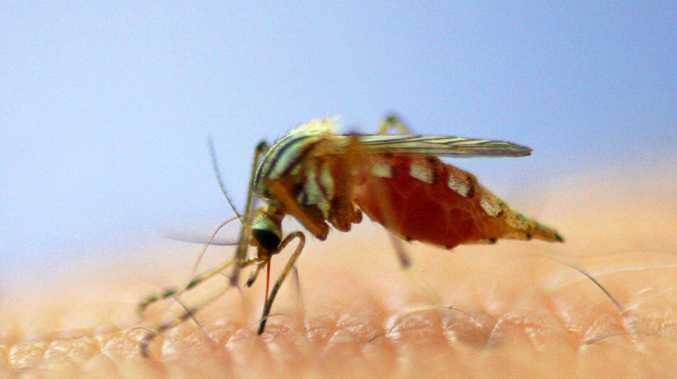 The plant emits a strong and lingering odour, similar to that of decaying meat. Because the petals and stamen are redolent of death, the flower is affectionately dubbed "the corpse flower". Standing somewhere between three to four and a half metres, the corpse flower has a frilly black skirt of thick, flesh like dark petals. The spooky flower has bloomed just ahead of Halloween. 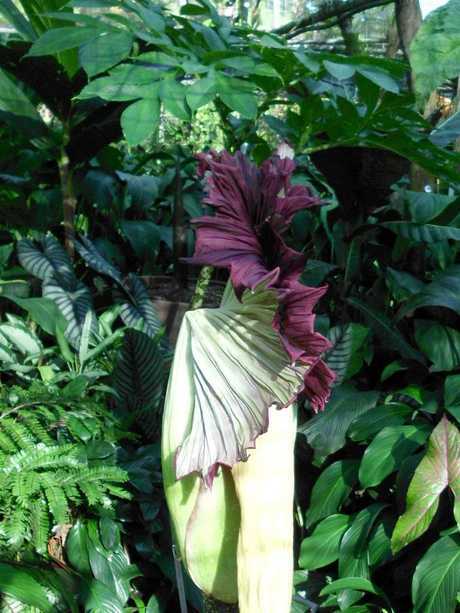 Adelaide’s corpse flower preparing to open. More photos below. 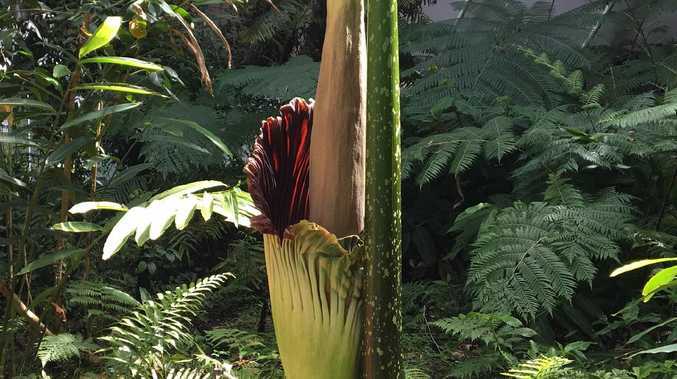 Australia's collection of corpse flowers is leading the world, according to Environment Minister David Speirs, who said the herbarium at Adelaide's Botanic Garden is leading research into this mysterious and endangered giant flower. The spooky dark petals of a corpse flower before it opens, which produces it’s own heat. "From just three initial seeds, the garden's collection has grown to one of the largest in Australian and one of the most significant in the world," he said. 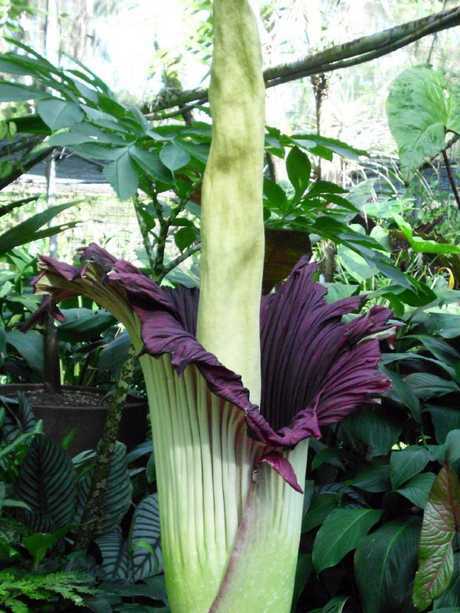 Adelaide has enjoyed four flowerings of the smelly corpse flower since beginning the plantings a decade ago. From their initial three seeds, effective propagation techniques have seen the botanists and horticulturalists involved in the program achieve great success, according to Adelaide Botanical Garden's horticultural curator Matt Coulter. 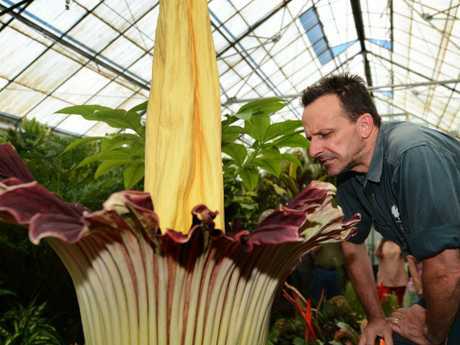 "Over the last 10 years, we have been working hard to develop techniques to successfully grow and propagate the rare titan arum," he said. The corpse flower produces its own heat during the flowering stage to attract insects for pollination. In Adelaide, botanists will be measuring this thermal output. The flower will also undergo DNA analysis by overseas experts keen to know more about why it has blossomed now. After the flower has been pollinated it will quickly die off. During non-flowering periods for this plant, the energy is stored in what is referred to as a corm. This can weigh up to 100 kilos. From the corm, a single leaf will shoot up form which the plant will photosynthesise, creating energy from the sun's rays. 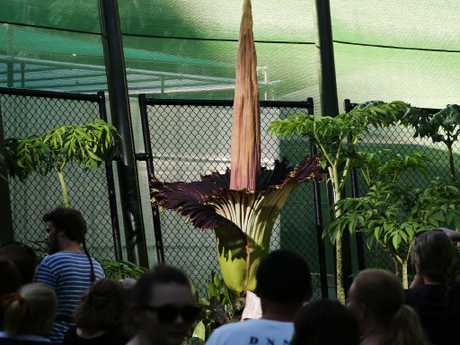 A corpse flower in full bloom at Cairns’ Botanic Gardens. Picture: Brendan Radke. For a short time this weekend you can catch a glimpse of a super rare giant corpse flower in Adelaide. A corpse flower can take around seven years to bloom and it's plant base can weigh round 45 kilos. The titus arum (the plant's botanical name) also produces its own heat and can get to temperatures similar to that of a human body. The plant is currently classified as "vulnerable" on the International Union for Conservation of Nature's (IUCN) Red List of Threatened Plants and is at risk of becoming endangered. A corpse flower takes around seven years to bloom.